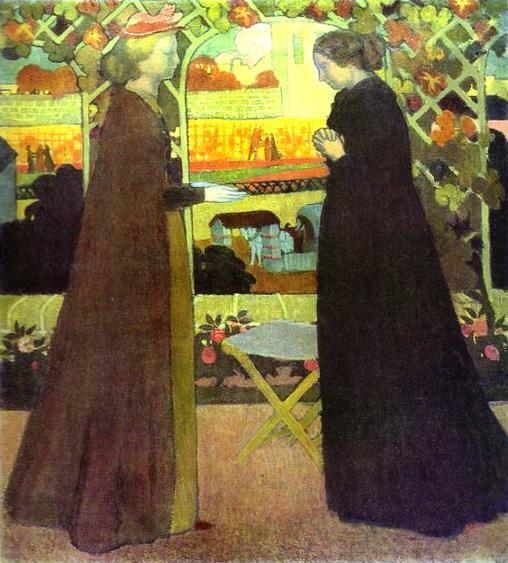 Maurice Denis. The Visitation. 1894. Oil on canvas. 103 x 93 cm. The Hermitage, St. Petersburg, Russia. The following story was told by Mother Agnes Mary Donovan, superior general of the Sisters of Life in her Dec. 10, 2009 address to the Nothing More Beautiful Congress entitled Witness to the Grace of Jesus Christ. “How did Elizabeth know that Mary was carrying the unborn Jesus?” our founder would ask. “Remember how Mary had exchanged her word for the Living Word, the Son of God, who would be conceived beneath her heart? That same Living Word reached out and touched Elizabeth. That’s the power of the Christ child within the womb of Mary. It radiated outwardly from that womb and penetrated the womb of Elizabeth, purifying John the Baptist as you and I are purified of original sin at Baptism. Let me tell you a recent story which is nearly a present day recapitulation of this New Testament event. As part of the 40 Days for Life, Janet and her friends, local faithful Hispanic women, witnessed before an abortion mill in Stamford, Conn., each week on their way to work. A young woman, Maria, who came to the clinic for an abortion appointment, came over mistakenly to speak with one of them. In the midst of the conversation they realized that this woman did not want an abortion, but without support for herself and her child, she had surrendered in desperation. In the midst of the conversation, Janet and her friends realized that they needed to leave to get to work and called the Sisters of Life to ask them to continue where they had left off and to help link this young vulnerable pregnant woman with the resources she would need. 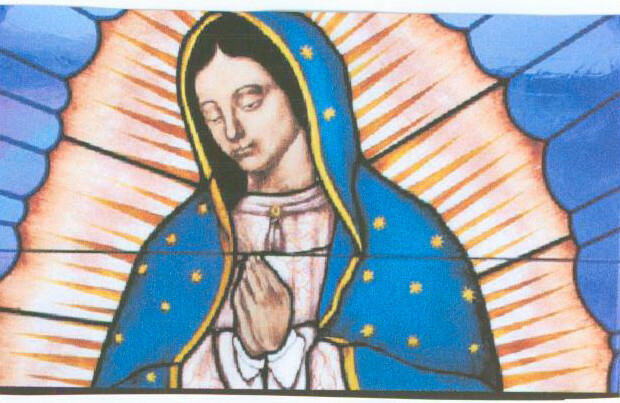 Our only Spanish-speaking sister was on an errand away from the convent that morning and other sisters who were home when the call came in went hurriedly to pick her up, and to bring her to the convent so that they might talk to get to know Maria and to understand her needs. They continued communicating using the only language they all shared – the universal language of love. After some time our Brooklyn sister remembered the Spanish Bible in the library, and returned with it encouraging the young woman to read the story of the Visitation – Mary’s visit to Elizabeth following the Annunciation of the angel and conceiving the Christ Child. 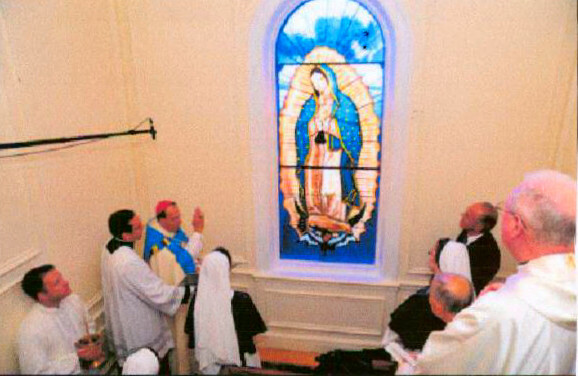 These are pictures of the stained glass window of Our Lady of Guadalupe,that was installed to mark the fifth anniversary of the Sister’s of Life retreat mission at Villa Maria Guadalupe. where is this beautiful piece of stained glass located? It is located in the retreat house of the Sisters of Life, Villa Maria Guadalupe Retreat House. This is the link to their site. http://sistersoflife.org/villa-maria-guadalupe-retreats The Sisters of Life are an order founded by the late Cardinal O’Conner from NY. They are a group of sisters dedciated to the Pro-life cause.